Also don't forget to check your timing also Brian. Where ignition occurs has a huge influence on how well an engine runs. I'm not having a lot of luck here. I played all day yesterday, doing all the usual tricks to get a engine started. Valve timing, ignition timing, carburetor settings. I even set the engine up in my main garage and ran it with a 110 volt electric motor for a couple of hours to get rid of any tight spots. No Joy!! Engine fires right up and runs along with the starter drill, but doesn't want to keep going on it's own. I am having an issue with the intake valve seizing open. I have never had that happen before, so I've been theorizing as to why this is happening. I think that there is a flaw in the design of the rocker arm, and that "at speed" the rocker arm which should only move the exhaust valve is being "flung" out so hard by the cam that it is over-travelling and hitting the intake valve. 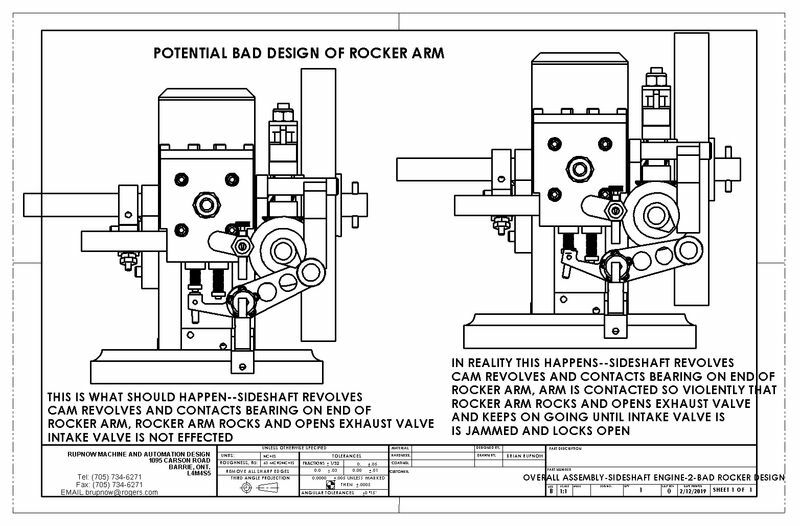 That is my current reasoning, so today I will investigate the rocker arm design. Will also do a bit of research and calculate the engines current compression ratio. I spent the best part of this morning redesigning the rocker arm so it gives a lot more clearance to the intake valve. 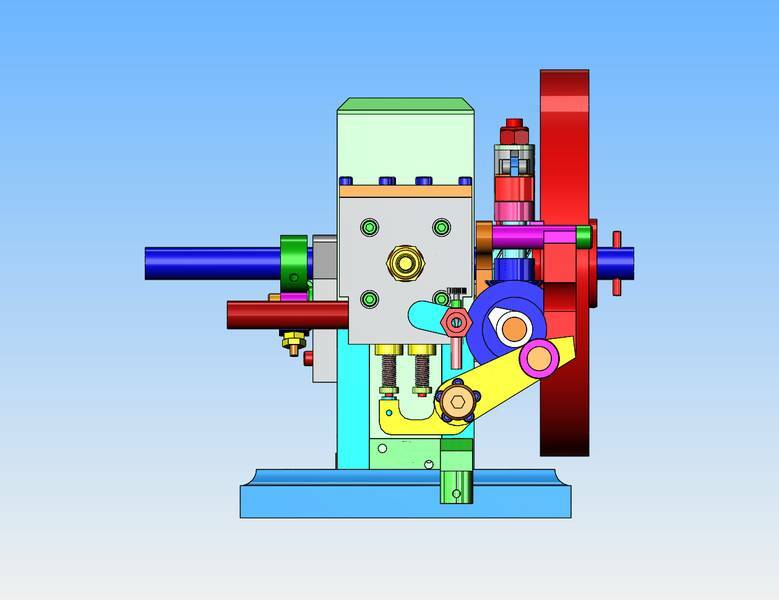 While I was deeply into the design, I noticed that the length and positioning of the arm which has the cam follower on it was not correct. I'm not certain how that happened, but it did. I will now embark on making a new rocker arm and cam follower arm. S&*t happens!! If I were working on a lawnmower or similar engine and had the symptoms that you describe I would say the poor running is a result of low compression. Not compression ratio but low compression. You reused your piston from a running engine so we can kind of eliminate that and you haven't mentioned any leakage at the head gasket or fittings so that only leaves the valves or something to do with the valves. The only other issue could be ignition timing but I'm sure you've tried all kinds of different settings. Does the engine 'bounce back' when flipping it over? Yes, it bounces back. Compression is good. The piston fit is very good, and at one point I persuaded myself to put one Viton ring on it. The engine seems to lack power. When you start an engine with a drill, like I commonly do, you can feel it when the engine surges ahead and wants to outrun the drill. My engine doesn't do that. It fires right along with the drill very happily, but I don't feel that surge of power which makes you think that the engine wants to run on it's own. I know it's not a matter of ignition timing, valve timing, nor carburetor. I think I will revisit the cam itself, and make a cam with a longer dwell as I had originally planned on doing, and begin to open the exhaust about 40 degrees before bottom dead center, and have it close right at top dead center. I really like this design, and I don't want to abandon it. Just hang in there and you'll discover the problem. Would the intake valve spring be to strong? It also has to deal with the weight of the valve to get enough fuel charge in. Since the engine fires quite regularly while being driven by the drill motor, it heats itself up quite rapidly. This morning I got up and machined a different cam, reverting to the first cam I had before George Britnell suggested the one which I have been using. I didn't think it would make any difference, and it didn't. The engine still fires quite merrily along with the drill, but won't take off and run on it's own. I am at the point now where I am seriously thinking of a different head design. 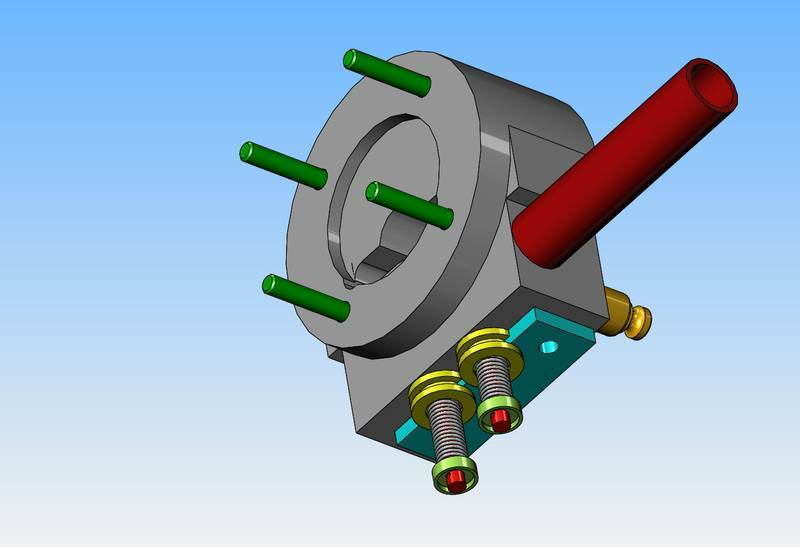 A "newbee" on one of the forums I post on suggested threading the outside diameter of the valve cages, fitting the valve, and then screwing the cages with installed valve into the head from the bottom. Something like that could work, and I know that a number of full size hit and miss engines were set up in a similar manner. I believe the problem I am having with my engine stems from having too large a burn chamber in the head. It is the only possible thing I can think of. I'm not exactly new at this business, this is my thirtieth engine. The outside diameter of my current valve cages is 0.394" (10 mm) and I don't think I could comfortably thread them and leave a thick enough wall, but if I do go for a new design they can be made larger.---Or they could be made to fit into a reamed hole in the cylinder head and held there by a retainer with a viton o-ring seal. A conclusion could be made that with a 1" bore, the engine just doesn't have enough power to run a sideshaft set of gears and a second set of gears which runs the governor, but obviously that's not correct because the engine did function quite well when I had the first cylinder head on it. Brian, we have an engine with valves at right angles to the bore as in your engine but I cannot find drawings of it however a picture of one may be useful.. It is a Bristol Cherub aero engine. 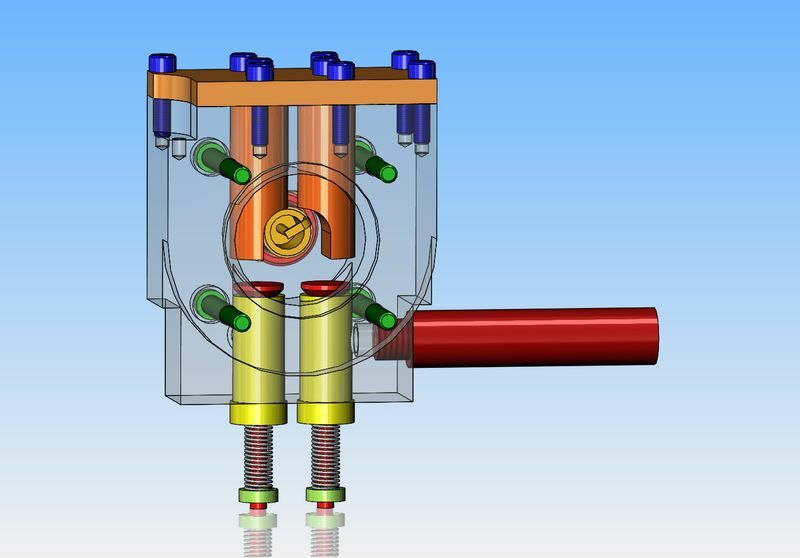 Thanks John Hill--I'm not saying I will do this----BUT --If I did make the valve cages and valves and valve springs and keepers two discreet assemblies, and just pressed/Loctited them in from the bottom, I could cut down on a ton of "burn space" in the cylinder head. Massive calculating and head scratching shows that in order for the new strange cylinder head to have the same cubic inch space as the first round cylinder head (with which the engine ran) it would have to be shaped like this. And even this would require the valve cages, valves, spring retainers and springs to be assembled as stand alone units and pressed/loctited in from the bottom of the cylinder head.---But---It's February, and I don't have anything else to do--- the current cylinder head which I have been trying to start the engine with (unsuccessfully) is about 4 times larger in terms of cubic inch space inside it. 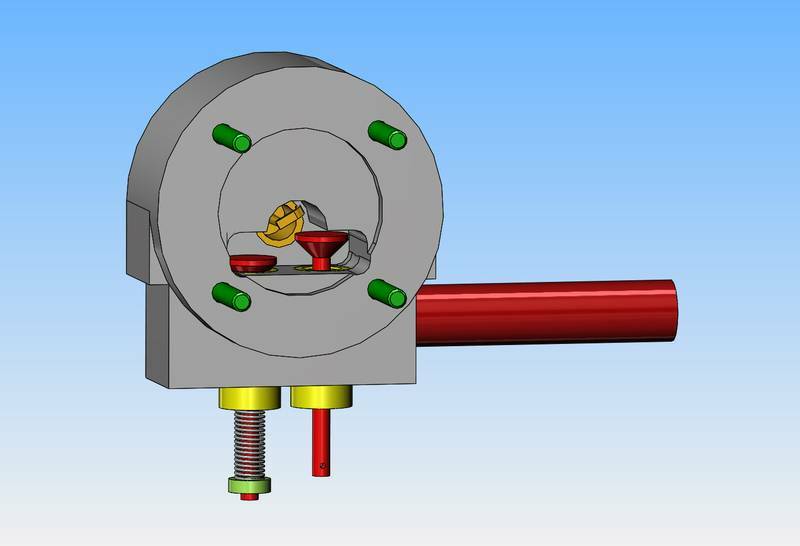 And I suppose that if I was afraid of the compression shooting out the entire valve cage, valve, and all the associated guts, I could groove the head of the valve cages and bolt on a retainer plate.--Although in reality, I've never had an engine do that. 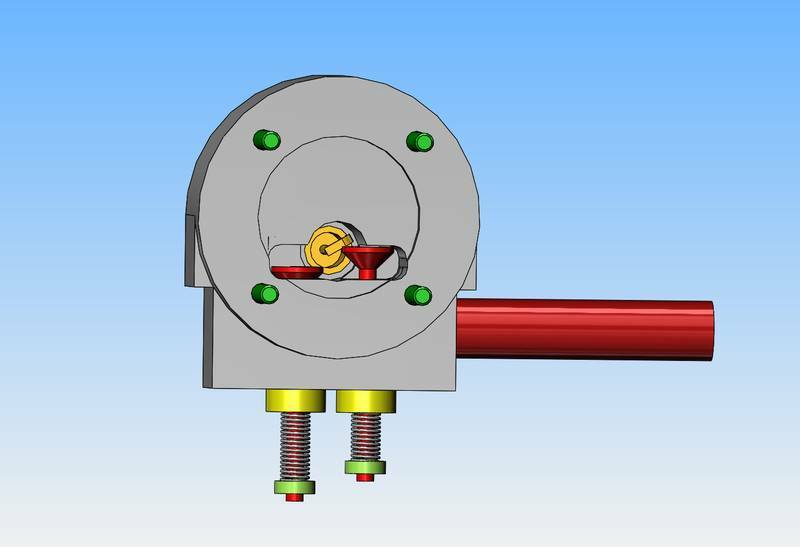 Okay--more insomnia inspired ideas--Since the exhaust valve is operated by a cam and must have clearance overhead to lift fully (0.156") plus about 1/16" extra clearance , the cavity over the head of the exhaust valve must remain as I have shown it. However--The intake valve is atmospheric, and never raises more than about 0.080" off it's seat, so the overhead on the side above the intake valve can be lower as I have shown it here. What I am trying to do here is cut down as much space as I possibly can in the "burn chamber" to give the engine higher compression. My piston, at top dead center is 0.176" from the end of the cylinder. 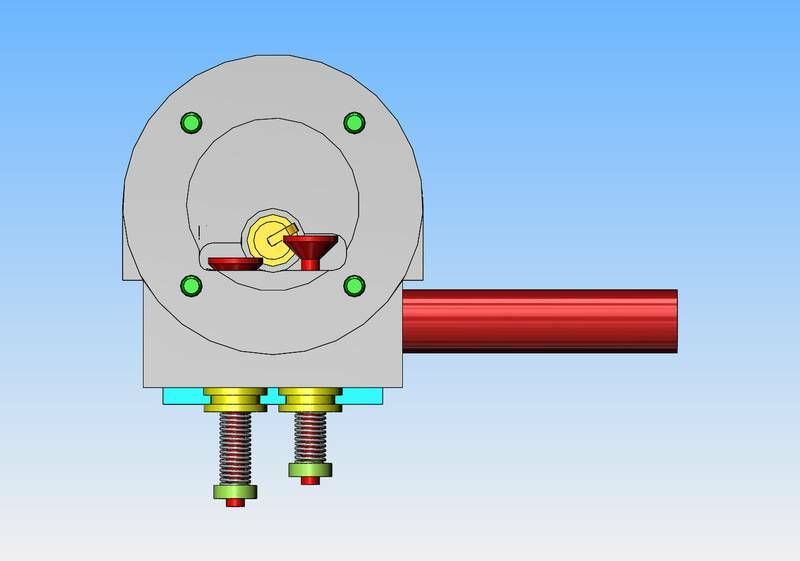 Since I have drilled and tapped the top of the cylinder for a "space filler", I can also put a 0.176" thick spacer on the end of the cylinder if I have to in order to drive the compression even higher. Bad Behavior has blocked 14548 access attempts in the last 7 days.